Blue Star Press, 9781944515485, 80pp. Color Your Mind: A Coloring Book for Those with Alzheimer's and the People Who Love is an innovative book filled with both information and inspiration. In a category all its own, Color Your Mind is the first and only coloring book created specifically for people with Alzheimer's. Authored by award-winning journalist, best-selling author, and Alzheimer's advocate Maria Shriver, this book was developed with insights from caregivers, neurologists, psychologists, and, of course, people with Alzheimer's. 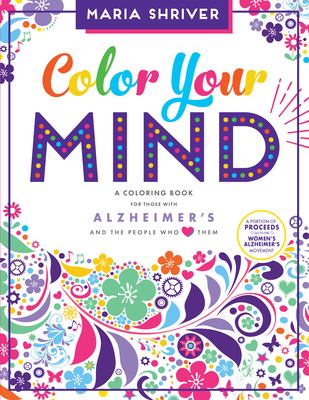 Color Your Mind is a resource for caregivers, family, and friends to help forge communication and connection with people with Alzheimer's or other forms of dementia. Each coloring page is accompanied by relevant information and prompts to help people with Alzheimer's and their caregivers to create, connect, and reflect. Color Your Mind is unique in that it connects coloring with helpful information about wellness, social connection, nutrition, exercise, moving the mind, and sleep--all valuable lessons for a fulfilling, balanced life. The activities, images, and approach in Color Your Mind were developed and refined through visits to nursing homes and memory care facilities. These visits and interactions also informed the selection of cheerful, inspiring coloring images throughout the book.